Mirabai Bush talks about contemplative seeing, ‘the mindful study of painting and sculpture as ‘beholding” (which involves appreciation, care, the involvement of our senses). We are able in beholding to ‘hold’ something in our attention until something emerges into our awareness. 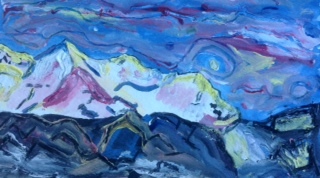 I called this painting ‘what the mountain was feeling..’ it came out of beholding this particular mountain range. What then came out was ‘the silent mountain was passionate.’ Of course, contemplative seeing is not limited to painting and sculpture, for me it began with the contemplative seeing of the mountain. Taking time to behold means that time can open up and we can have a moment of clear seeing, an epiphany.